Considering the effervescence of the performances, what other than this warm, bubbly feeling could have been its aim? In fact, their ignorance only highlights the modest nature of some of the most effective charities. For if celebrities were honest with the rest of us, they would admit that their efforts in “raising awareness” of pressing yet frustratingly hidden issues are often simultaneously dedicated to raising awareness of their awareness of said pressing yet frustratingly hidden issues. In an age of spiteful spectatorship, picking the right charity can go a long way in protecting social capital. An unfair criticism, to be sure. If there is one sector of civic life that is beyond reproach, it’s community service. Nonetheless, the increasing commoditization of philanthropy, slung over the shoulders of multiplying celebrities and faux-celebrities like accessories, often has the tragic consequence of overshadowing noteworthy causes. The low-key personalities and performances that Keane assemble here ensure that no such upstaging takes place. Beginning with Teddy Thompson’s purposeful dressing of “(From Now On All My Friends Are Gonna Be) Strangers,” War Child feels like a gathering of casual friends and local musicians at the town hall for a seven o’clock Thursday night revue, more Billy Bragg than Bono. 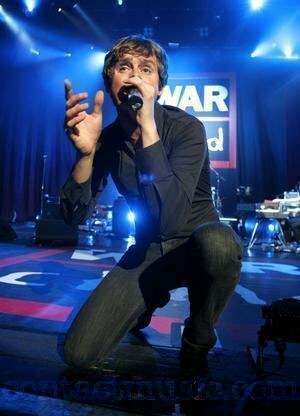 Keane crooner Tom Chaplin, dressed in unflatteringly tight black jeans, introduces the event with such awkward yet bubbling praise you might suspect he was unveiling a high school bake sale. Barely clearing an hour and a half, it certainly feels like a weeknight at Brixton Academy, but then again, a 1.5 million pound target is nothing to sneeze at. The guest list includes Lily Allen, Brendon Benson, Teddy Thompson, The Magic Numbers, Findlay Brown, Guillemots, and Pete Shop Boys, but -- and this may be the only time you read these words in print--Keane easily gives the most electric performance of the bunch, hop-scotching through Under the Iron Sea barnstormer “Crystal Ball” and even pulling off an ebullient cover of “Under Pressure.” Sure, they’re the hosts of the event and should thus aim to please, but that’s no excuse for handily outperforming synth-pop legends Pet Shop Boys. 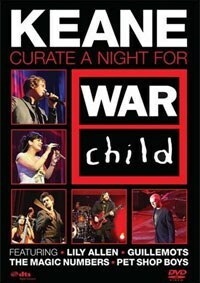 Now, what this bit of news implies for the other War Child acts relies heavily on your imaginative capacity to cede to Keane’s abilities as a live act. Frankly, if the idea that Keane is capable of producing a spirited if brief live set is too much of a stretch, than your interest in this release is probably non-existent to begin with. As benefits go, War Childhas it nearly right, portraying communal sensibilities alongside playful if generally unaffecting performances. As music documentaries go, it’s a snooze. If way back on the night of the event the organizers had sent around a sheet for fans to sign up for a copy of the forthcoming concert DVD (from which a generous portion of the proceeds might go to the War Child fund) then maybe, maybe it would have been worth the purchase. As it stands, War Childis hardly essential viewing.